Hi everyone, as you know I am Miss. Carpenters brother who is living in Antarctica. I have finally settled after my long journey from America. Currently I am at the McMurdo Station. While I am here I would like to share my stories and experiences with you. I have been here a week now and am trying to learn how to make a web site. It is a work in progress and I hope to make it better each week. You can help me by continuing to send your good questions. After I sent you the picture of the airplane last week the weather has improved a lot. This week has been mostly sunny but still cold. Today was only 1 degree above zero, however when the wind blows the temperature went all the way to -50 degrees. Brrrrrrr!! The first question I received from you was a good one. What do you eat there and how does it get to you? Well, most of the food is very similar to the kind of food you get at home or in school. However a lot depends on which field camp I am at. 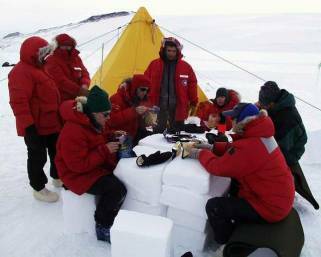 Here in McMurdo we eat in a big cafeteria. 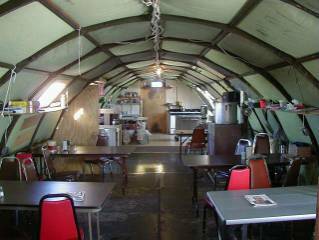 When I go to field camps I may eat in a big tent or out side like these ones. As we are very far away from home you wondered how our food got here. We do have airplanes that fly between here and New Zealand. Some times when there is extra space they will bring us some fresh fruit and vegetables. Most of our food though comes on a ship, which visits us only once a year. 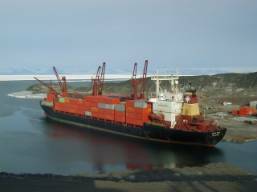 The ships name is the Greenwave and it carries all of our food and supplies. Imagine if you could go to the store only one time each year. This is a picture of our ship when it visited us last year in February. So what time is it here? Very good question. We actually are on the same time as New Zealand. If you look at a globe we are due south of them so we fall in the same time zone. This puts us 18 hours ahead of you in Ripton.